"It appears when you least expect it. Its cries sound like incantations. Those hearing it are tormented by headaches and hallucinations." 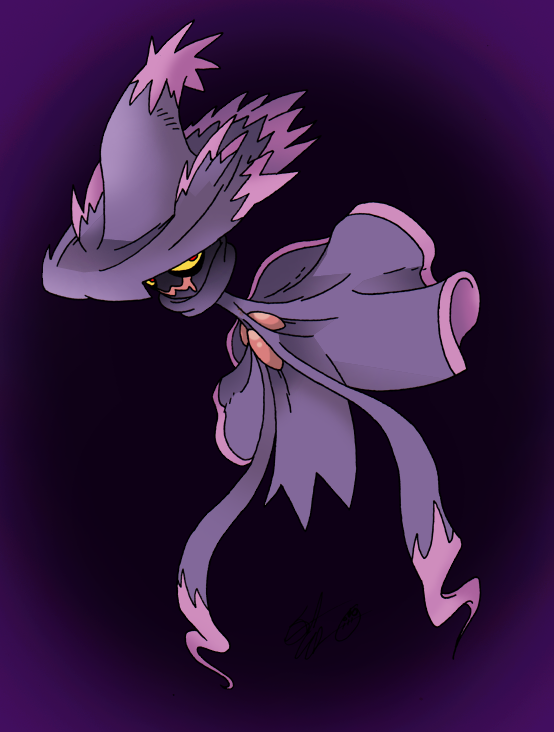 Mismagius is one of those scarce few added on evolutions from Gen 4 that greatly improved upon it's earlier form (Unlike the travesties that are Honchkrow, Electvire and Rhyperior) in addition to looking pretty awesome, Misdreavus was just one of those poor Pokemon that totally fell to the wayside. It was the only other Ghost-type brought in for Gen 2 and man; how lackluster? I mean, I like it and all but it's just so forgettable, it really needed something else to give it some 'oomph' and Mismagius definitely did that... though yeah, it's still not really one of my all times favorites, I dig the magician/witch look but there are others I like more so why it ended up considerably low, that and the picture's bland. Whatcha gonna do? Nice'n'spooky, but I'm gonna hafta fight you over Honchkrow :| Do not mock GangsterPimpcrow!